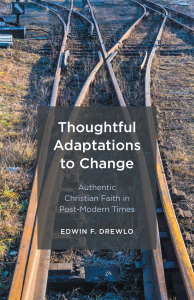 I’m pleased to announce that a second printing of my book, Thoughtful Adaptations to Change: Authentic Christian Faith in Postmodern Times, has just been launched. In Canada, the new edition is available at the Friesen Press Web-site. The Book is also available for wholesale and retail outlets as “on-demand” printing through Ingram Book Publishing Services. The book features questions for reflection and discussion at the end of each chapter suitable for use in a classroom or small group settings. Everyone is talking about the radical changes that have taken place in western society in the last few decades. Though it’s always been so, the gap between right-wing and left-wing politics appears to be widening. This is evident in the election of Donald Trump as president of the United States, but also on the political scene in Canada. There is a good deal of vitriol expressed toward the new president of the United States. But in Canada too, Prime Minister Justin Trudeau, has also angered many people. In the United States, people are angry about the pro-Christian stance of the President. But in Canada, it’s just the opposite — people are upset about the Prime Minister’s disregard for certain Christian values. In both cases, there is a general sense of reaction to traditional Christian teaching. The most recent evidence of a negative attitude toward Christian values in Canada was the case of the Supreme Court’s ruling against Trinity Western University to qualify in two provincial legal societies (British Columbia and Ontario) to have its law school graduates credentialed. The reason given was Trinity’s requirement to have all students sign their agreement with the University’s code of conduct. That code includes a commitment to sexual relationships within the confines of marriage between a man and a woman. In the view of the Supreme Court judges, according to the seven / two ruling, Trinity’s requirement doesn’t balance the right of those who have a different view of legitimate expressions of sexuality including homo-sexuality. In their opinion, Trinity’s position implies a bias against people of other views which could affect graduates’ sense of jurisprudence. In the view of many, it’s a case of secularism over-riding Christian conviction, or secularism curtailing religious freedom. The ruling at this time demonstrates the degree to which Canadian society has changed in the last seventeen years. At that time (May 2001), in a similar case between Trinity Western University and the College of Teachers of British Columbia, the SCOC ruled in favour of Trinity Western to graduate students in the Faculty of Education citing the principle that the freedom to hold beliefs is broader than the freedom to act on them. The book, Thoughtful Adaptations to Change, is a modest pastoral attempt to explain philosophically why this change in western society has taken place. It explains how western culture reflects a transition from a pre-modern era, to a modern one during the 16th to 20th centuries, and then to a post-modern one during the latter part of the 20th century. The book explains how modernism was built upon the assumption that the scientific method developed by Francis Bacon was the best way to obtain knowledge about reality. During the modern period, it was assumed that truth was based on the existence of reality outside human consciousness and that such truth could be apprehended by making the right kinds of logical inquiry. It was believed objective reasoning could also be used to arrive at conclusions about the existence of God. Christian theology and mission grew exponentially during the modern period because of an appeal to the existence of objective reality and the human capacity to objectively apprehend reality, including the validity of the Holy Scriptures. But the book also explains the limitations of scientific approaches to the comprehension of reality and faith during this period. It shows how the development of postmodernism was a natural result of the limitations of the scientific method to explain reality. Though postmodernism rejects the concept of absolute truth outright, which produces all kinds of difficulties in its own way, it successfully demonstrates that the scientific method is not adequate in explaining every aspect of reality. And this, of course, applies to faith toward God.as well. For example, Christians readily agree that science alone is never adequate to establish faith in God. There is a dimension of faith that is much more than the human ability to comprehend the nature of truth — that it comes by supernatural revelation from God. (i.e. Hebrews 11:6). To be sure, as the book illustrates, there is much that has been lost in our world through the move toward postmodernism — simply because of the loss of the idea of objective truth in our day. Postmodernism has opened the way to various speculations about the nature of reality chiefly landing on the side of subjectivism — that everyone has their own idea of what constitutes truth and reality. This has made it difficult for Christians to present good reasons for faith, as in the modern era. In this context the Christian faith is just one more amidst the cacophony of voices about that which is true. People are inclined to listen to those who really demonstrate that they care, rather than to those who profess to know what is true. Postmodernism has changed the way Christians think and relate to the world. It’s good that Christians are challenged to be more caring, but it’s not good that they tend to be less concerned about the accurate understanding of Scripture and its applications to daily life. Many who have read the book report on new insight and understanding about why western culture has become increasingly secular in these times. They also have spoken of its value in helping Christians understand how they can be more fruitful and effective in living out and sharing the good news of Christian faith. With these testimonies in mind, I am confident that the book is able to make a valuable contribution to the education of young and old and a more vibrant faith . I am hopeful that the book will gain a hearing among Christians both in the church and among those who are studying how to be better ministers of the gospel in these times. Hopefully pastors, small group leaders, and Bible College professors will benefit a lot from the insights that have been explained in this project.